Pittsburgh news: Mccain volunteer Ashley Todd mutilated after attack! Shame! | Cafe Arjun - 15 times WordPress Top Blog! Pittsburgh news: Mccain volunteer Ashley Todd mutilated after attack! Shame! Ashley Todd, 20 was attacked at Bloomfield, Pittsburgh. This happened when she was getting some cash from an ATM, the police said. A mirror image of the alphabet “B” was carved into her face in a ruthless way. Ashley Todd, who’s a republican supporter, volunteering for John Mccain in this 2008 election was robbed and mutilated. Channel 4 reported in the Action news program that Todd was robbed near Liberty Avenue (pearl street) just before 9pm after being threatened to be stabbed by a person carrying a knife. Diane Richard, reporting for Channel 4 confirmed that she was robbed of 60 dollars. The robber, it’s claimed, saw the Mccain supporting label on Ashley Todd’s car and used a tool to write B (mirror image) on her face. The “B”, as is obvious is being widely believed by a Barack Obama supporter. 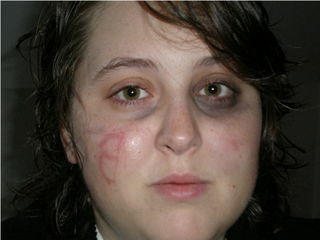 Ashley Todd was also punched and kicked (the image makes the dark circles around her eyes very clear). Surprisingly, Ashley Todd refused to be treated for her wounds when asked by the police. Hopefully, the entire incident has been record on CCTV cameras and the guilty will be punished. The culprit, reported a male, was a black man, very tall (about 6 feet 4 inches) weighing about 100 kgs and with brown eyes. He was wearing a black undershirt, shoes and perhaps a dark colored jeans. Ashley made this story up – Read comments for more. ← $150k on clothes, makeup, hair – That’s Sarah “hockey mom” Palin for you! Wearing a black undershirt at 9PM in Pittsburgh. Where it was 43 degrees fahrenheit. A black, 6’4″ Obama spporter near an ATM, who also stole 60 dollars is nonsense. I don’t think this has anything to do with Obama or McCain. its a simple, stright and shameful robbery on a poor little girl. Personally, I’m doubting that the attack ever happened. There are plenty of cameras at that intersection. If something happened, or didn’t, we should know very soon. Why would the perf put a backward B, unless it was self-inflicted in front of a mirror? She confessed, made it all up. PITTSBURGH (AP) — Pittsburgh police say a McCain campaign volunteer who said she was held down by a black man who cut the letter “B” in her face has changed her story. Police spokeswoman Diane Richard says investigators gave the 20-year-old woman a lie-detector test and are “looking at some inconsistencies” in her story. The student, Ashley Todd, of College Station, Texas, initially said a black man robbed her at knifepoint Wednesday night and then cut her cheek after seeing a McCain sticker on her car. Police say bank surveillance footage doesn’t show her at an ATM where she says she was attacked. Todd, who is white, now says she was knocked unconscious and doesn’t remember being cut. She now says she only discovered the wound later. As soon as they heard about the incident , McCain and Palin rushed to make personal calls consoling the “victim” and promising her full support. The McCain campaign was going to have a field day. The argument would go something like this: Obama’s campaign has encouraged their supporters to “get in the faces” of anyone supporting McCain. This led to black criminal elements in the Obama campaign taking things too far. Obama needs to rein in his people before someone gets killed. He’s running a Mafia like campaign to intimidate white voters. Bloggers were complaining online that the Sarah Todd assault story wasn’t getting enough play in the liberal media. Right leaning Bloggers are quickly removing any references to the name “Ashley Todd”. All you get is the message “Sorry, the page you were looking for in the blog . does not exist. But because they made such a big stink about the incident in the first place Everyone is talking about Ashley Todd….The McCain campaign worker who lied. So here’s my question: “Is there so much hatred and loathing of Obama among McCain supporters that they have to resort to concocting “Willy Horton” type stories complete with fake assaults, robbery and facial disfiguring to frighten white voters to cast their vote against a black man. The woman could very easily have said she was attacked and robbed by an Obama supporter. Why throw a 6’ 4” 200 lb knife wielding black man into the mix. Does it add to the drama. Does it play to every white woman’s fears of dark alleys with strange black men? We are all relieved that this incident never happened. It would have been one more divisive wedge in a country where race and bigotry are still alive. Fortunately for us all, at least one McCain’s campaign worker can’t carve the letter “B” correctly.